Henry de Bromhead's Petit Mouchoir has made great strides since falling in the Fighting Fifth Hurdle at Newcastle and was holding Willie Mullins' Nichols Canyon when that horse came down at the final flight under Ruby Walsh. Mullins' other runner, Footpad, made late inroads on the leader on the dash to the line, but David Mullins just had to keep Petit Mouchoir (an easy-to-back 9/10 favourite) up to his work to hold the advantage, having a length in hand at the winning post. De Bromhead was completing a big-race double after the victory of Some Plan in the Arkle Novice Chase, which had also seen Walsh come to grief at the last, that time when in the lead on Royal Caviar. Grand National-winning rider Mullins, on the other hand, was enjoying much different fortune to when exiting the Arkle at the first fence on Identity Thief, who like Petit Mouchoir is owned by Gigginstown House Stud. He said: "It's been a great week (also won Thyestes Chase on Champagne West). It wasn't a great start to the day with Identity Thief, but thankfully he's gone and done the job. "He has a serious amount of ability and has such a high cruising speed that you never feel like you are under pressure with him. He's a terrific horse." He added: "We went a right good gallop and he stuck at it and jumps so quickly, he's a bit of a monster of a horse really. Ruby kept us honest, I felt him getting to my girths at the second-last and to be fair to my lad he put his head down and really galloped the whole way up the straight. "He's a bit of a monster, he just doesn't know when to stop. The speed we went today, I don't think I've ever gone as fast, anyway. He still wanted to go a stride quicker, he's got some engine and no real flaws. "He just has an incredible amount of ability. I'm delighted to be riding him and getting the opportunities from Henry and Gigginstown." 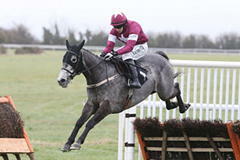 De Bromhead said: "It's hard to do what he's done twice now, bounce out and just go flat to the mat the whole way. Footpad finished a bit closer than at Christmas, but it's still a really good performance and I'm delighted with him. "He was taken on a bit earlier this time. Ruby didn't let him out of his sights, and they were racing a lot sooner which made it more open to a horse coming from behind. "He reminds me of (Sizing) Europe in that he needs a strong gallop the whole way. He's not a fast horse at home, he's a galloping horse and they just need that good, strong gallop. He's brilliant in that he can go out and make it for himself but he doesn't have to make the running. "It was a super ride from David, and I'm just delighted to have a horse like him. "I'll have to speak with Michael and Eddie (O'Leary), but the Champion Hurdle at Cheltenham will more than likely be his next race." Petit Mouchoir remains a 4/1 chance in Sky Bet's non-runner no-bet market on the Champion. Eddie O'Leary, of owners Gigginstown House, said: "He was very, very good today. He's obviously improving, the trainer's convinced he's improving hand over fist. He jumped brilliantly, he just missed the last. "Ruby just didn't let us get away this time and got us racing a long way out, so maybe that set it up for a closer like Footpad, but we're thrilled. "It was a fantastic ride by David, the horse loves jumping at that speed and hopefully, all going well now, he'll go to Cheltenham. He's only six and if there's a horse improving in the race, hopefully it's him."